After more than 2 years of preparation, Meejmuse launched her own brand; "The Muse Beauty" March last year, 2017. Her own motto since she started Youtube in 2011 is "Beauty from within, without". Since then, it's always been her dream to start something on her own where she can share her motto, message, and her inspiration behind it. 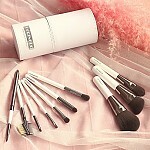 Here’s we have her product, brushes set! 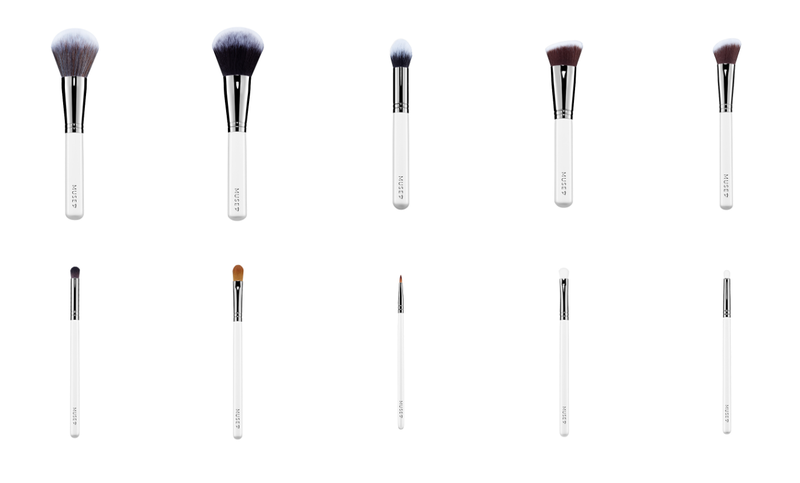 All the brushes are handmade in Korea and not forget to mention they are all 100% Vegan and Cruelty-Free! A domed powder brush shaped for a roll-on or buffing application of loose and pressed powders. Great for setting make up to achieve a light finish for any look. May also be used for powder blush or bronzer – get creative! Denser and fuller than the #170, this fluffy, semi-domed powder brush is designed for a luxurious application of loose or pressed powders. Perfectly shaped to embrace all the contours of your face, it can be used in a flat patting or circular buffing motion for a soft, face-hugging finish every time. A soft but dense angled-brush with all the optimal curves to assist in the seamless buffing on of foundation. Using circular motions, buff liquid or cream product outwards from the centre of the face for a quick, easy and streak-free skin finish. Wash regularly for a flawless application every time. A petite, angled-blush brush that offers precise placement of blush right where you want it. 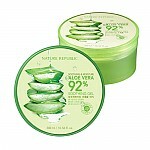 Can also be used for highlight, contour or under-eye powder application. 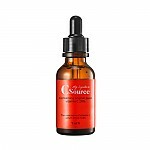 Works well with all powder, liquid or cream products. A soft, semi-tapered multi-tasking brush designed to help sculpt or highlight the face - with precision. Use with powder, liquid or cream products to contour under the cheekbones, jawline and temples, or for an ultra-smooth application of highlight. Pinch sides of the brush head for easy nose-contouring. Have fun with this brush! A deceivingly soft, flat paddle brush curated to help make concealer application truly easy. Blending is made easy with its flexible rounded edge, while its super-soft synthetic hairs make for an ultra smooth, streak-free finish. Perfect for the under-eyes, or for other small-area blending. A small, domed eye brush for small-area blending that promises never to prickle. 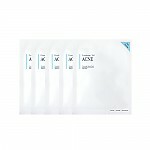 The rounded shape and plush texture ensures for an soft and even blend every time. 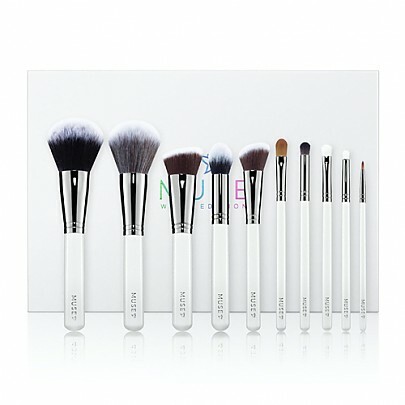 Can also be used for regular eyeshadow application or other precision work, such as nose and mouth contouring. 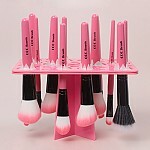 A flat, multi-functional brush for eyeshadow or pigment application. A must-have tool for any eye look! Designed with soft-yet-resistant white synthetic fibres, this brush offers accurate application with full product visibility for easy maintenance of brush cleanliness. A soft, petite pencil-brush designed to optimize your precision eye-work. Perfectly shaped for the inner-corner highlight, it can also be used for the under eyes, in the crease, or even to highlight the brow bone or nose bridge. Make it whatever you want! Your best tool for perfectly defined #eyelineronfleek eyes. A thin classic liner brush with soft, smooth bristles and a pointed, flexible tip. Use with cream, gel, liquid or even powder products to line the eyes with precision, whether to fill in the waterline or draw a bold wing!